Bisa dimainkan Secara Wifi LAN dengan teman-teman, salah satunya harus tethering gan. It’s the return of the famous series of games about World War II! 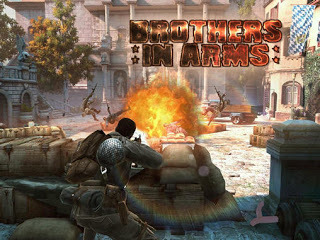 You will find a great game in the style of “action”, where you will be involved in the shootings, killing their enemies. In the role of Sergeant Wright you will use experimental weapons and visit the dramatic adventure that will begin landed in Normandy. Together with his men, armed to the teeth, engage in battles and win them. Do not forget to improve your weapons, skills and give battle the deadliest enemies. You will find a great graphics in the form of striking interiors, changing weather and time of day.